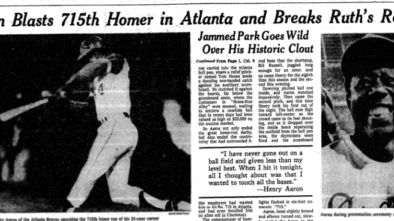 Hank Aaron hit 93 homers in the first month of the season, his lowest total of any month. Which month was Henry’s most prolific? Answer below. You may know it as Dodger Stadium, but this season you may call it “The Launching Pad.” Through seven games, there have already been 30 homers hit in LA, that’s about 4.25 homers per game. Last season, Dodger Stadium was home for 214 homers in 82 games, that’s a rate of 2.60 homers per game. So far this season, the Angels, Twins, Indians, Tigers, Rockies, Pirates, Royals, and Reds combined have totaled 18 homers, the same for the Dodgers who have hit 18 thus far. There have been six homers by pitchers this season hitting one homer every 25.17 AB. There have been 17 homers hit by second basemen this season, that’s a rate of one homer every 41.18 AB. There have been 15 homers hit by catchers this season, that’s a rate of one homer every 42.33 AB. Trea Turner has hit the only walkoff homer thus far this season. Paul Goldschmidt has the only three-dinger game thus far, while 10 other batters have gone deep twice in a game. Khris Davis and Cody Bellinger lead the majors with five homers apiece. Bellinger leads the majors with nine RBI from his homers. The World Champion Boston Red Sox lead the AL having allowed 17 homers. Nelson Cruz has homered once for the Twins and Kole Calhoun has homered once for the Angels, those are the only homers hit by each of those teams. The Red Sox are 0-4 in games in which they haven’t homered this season. In 2016, Zack Greinke allowed 23 homers; in 2017, Greinke permitted 25 homers; last season, Zack gave up 28 gophers; so far, this season he has allowed six homers, the most in the majors. They call them “clean-up batters” because number four hitters are supposed to sweep clean the bases. So far this season, #4 batters in the lineup lead the majors with 39 homers. Interestingly, leadoff hitters and #9 batters have each hit 23 homers. The fewest homers have been hit by the number seven batters who have only gone deep 11 times. Christian Yelich is looking for back-to-back NL MVPs and has gone yard four times this season. His next homer will by the 100th of his career. Same for Eugenio Suarez who only has one homer this season (his 99th). In the category of “what do I know?” I believe that there needs to be more green lights on 3-0 counts. I know I’ll get some support from Hanley Ramirez who took a Jake Odorizzi 3-0 pitch deep. Mike Trout, Aaron Judge, Jose Ramirez, Giancarlo Stanton, and Nolan Arenado have combined for no homers this season. That’s “no” as in ZERO. 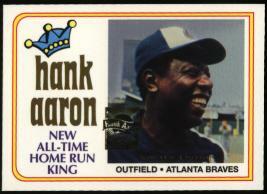 Trivia answer: Hank Aaron hit 152 homers in July two more than he hit in June, his two biggest home run months.